The MEPs who drafted a damning report about Malta had already decided what they were going to say before they even landed on the island, Prime Minister Joseph Muscat said on Friday. Published yesterday, the European Parliament report called on politicians perceived to be implicated in “serious acts of corruption and money laundering” linked to the Panama Papers to be removed from public office. Retaining them, the report said, affected the government’s credibility, fuelled a perception on impunity, and could result in damage to State assets. Asked whether he would take on the recommendation to sack those named in the Panama Papers, Dr Muscat said simply “we take our decisions” – implying he would not be told who to fire by Brussels. “I disagree with the analysis [in the report], I still respect it, and I met with the delegation. But I think that most of the things they wrote in the report were basically decided beforehand,” he told Times of Malta on the steps on the Auberge de Castille. The Prime Minister said he would have rather have had the delegation of MEPs visit Malta before the EP voted on a resolution on the rule of law in Malta. Dr Muscat was more keen to talk about the part of the report that dealt with the Russian whistleblower who is central to the allegations that his wife was the owner of the secret offshore company, Egrant. “What really caught my eye was that the so called whistleblower is saying she wasn’t the source of the information – that for me was quite interesting reading,” he said. 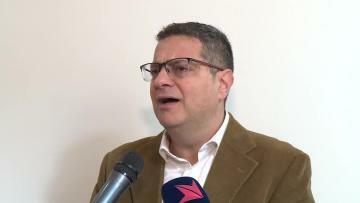 Speaking on Friday, Nationalist Party leader Adrian Delia said he could not understand why the Prime Minister refused to act to stop the harm to Malta's reputation. "My biggest concern is that the government knows that our reputation is being harmed, but it is persisting down this path," Dr Delia said. The PN leader recalled how Dr Muscat had previously said that he could not afford to lose Konrad Mizzi and Keith Schembri because they were tasked with key projects. "Why won't the Prime Minister take a wise and simple decision, based on facts not speculation?" he asked. "Let's do the correct thing. People under investigation should not occupy public office until those investigations are concluded." Watch Dr Muscat and Dr Delia's comments in the above videos.